Transmission Corporation of Telangana Limited (TS TRANSCO) Assistant Engineer Answer Key Paper and Question Paper Download. TS TRANSCO has successfully completed Assistant Engineer written exam on 29th Nov, 2015. Candidates who are finished TS TRANSCO AE Exam they all waiting for answer key. Official answer key paper not yet released, this will be updated soon on its official site. 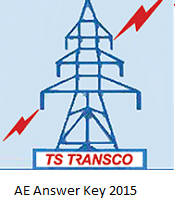 Below are the details of TS TRANSCO AE Question Paper and Answer Key Paper collected from Sakshi Education and Eenadu. Former President of the board of Control for Cricket in India (BCCI), ……….passed away very recently? PM Narendra Modi inaugurated first branch of ….. in china at Shanghai during his official visit to China? Which Kakatiya ruler laid the foundation for the Warangal fort? The famous shiva festival of Qutab Shahi age in Telangana was? The famous ‘Telangana March’ was held on? Main Memory is also called as?